Does this time of year and the light deprivation make you emotionally imbalanced? Or perhaps you experience drowsiness, slow reactions, gain excess weight or have trouble sleeping? Want to eliminate those feelings of lethargy and lose those pounds? It doesn’t promise anything (so basically don’t expect a miracle), but the goLITE BLU is designed to help you prevent these problems. 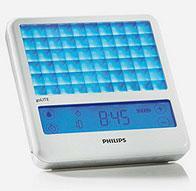 It does this by providing light therapy – emitting blue light waves designed to make you feel better. I don’t get it. If you’re deprived from sunlight, a blue light isn’t exactly a substitute. But according to a Philips spokesman, “blue light stimulates our biological clock the same way as watching the blue sky in summer” (funny, I didn’t know the sky had that kind of effect). There have been trials. These trials have shown improvement is noticed as early as after a few days of use, using the device as little as 15-20 minutes a day. I can’t say I’m convinced and it’s fair to say you’ve really got to have a strong belief in this product, as you’d be mad to spend $249 USD on what is essentially a blue lamp.